The 25th annual Miami Yacht & Brokerage Show will host NISI as it unveils exciting details about the new NISI XPRESSO Series. 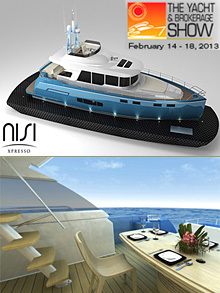 Detailed specifications and plans of the recently announced NISI 1700 XPRESSO (17m/58ft) will be available during the show, in addition to the NISI 2400 debut model, which will be on public display and available for viewing. NISI will be exhibiting at the centrally located RAMP 15 along Collins Avenue in Miami Beach. NISI Collection now spans 58 to 86 feet in length. NISI Custom builds are tailored from 98 to 118 feet. The 25th annual Miami Yacht & Brokerage Show runs February 14-18.